If you suffer from internet withdrawal while flying, help is on the way. 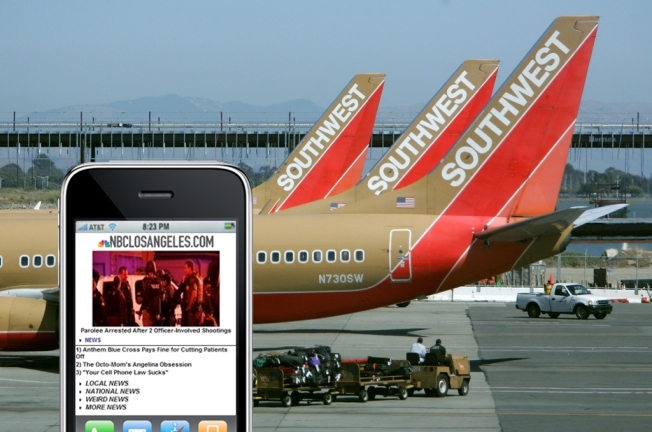 Southwest Airlines announced it will begin testing in-flight Wi-Fi Internet. The system uses a satellite based internet connection operated by Row 44, a California technology firm. The service is available to passengers with their own Wi-Fi enabled laptops or smartphones and will be free during the test period. Three more planes will be equipped with the service by early March. "Internet connectivity has been high on our list of priorities for quite some time," says Dave Ridley, senior vice president of marketing for Southwest Airlines, in a statement. Southwest joins a growing list of carriers including Virgin America, Delta, and American Airlines that offer in-flight Wi-Fi. Southwest is the only airline using satellites to operate its service which will allows Internet connections to remain on when the aircraft is flying over water. Other carriers, which are working with Chicago-based Aircell, use ground cellular towers to beam transmissions and their connection is available only when flying over land.